Indyref postmortem I: What went wrong in Edinburgh and the North East? Scottish mainland Travel to Work areas. The average population of our 32 councils today is roughly 170,000 people. The European average is closer to 14,000. The highly devolved Germans have municipal councils of just 7,000 people. 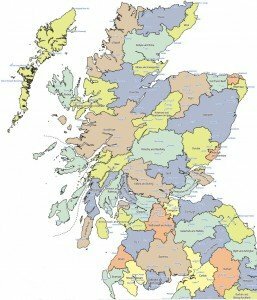 And lest anyone think our dispersed rural populations constitute an argument for larger councils, neighbouring Norway has 428 powerful local councils and 19 county councils for a smaller population than Scotland. It’s of course hard to create perfect council areas in a country where half the population lives in a very small area while half the country is barely inhabited at all — the councils simply can’t have both a similar physical size and a similar population. Something has to be done, however, but I haven’t seen any good proposals for new administrative boundaries. I therefore found it interesting to discover that the ONS have worked out the current commuting (travel-to-work) areas based on information in the 2011 census (see the map above). If I’ve counted them correctly, it divides Scotland into 44 areas. The areas are similar in size, but as a result, some of them have huge populations — for instance their Glasgow area includes not just Glasgow but also East Renfrewshire, East Dumbartonshire and other council areas. I therefore have my doubts it would be a good idea simply to turn these travel-to-work areas into new councils, but the map might provide a useful starting point. Alister Rutherford liked this on Facebook.